Yayzap is identical to GamesZing, TapBreaker, both of which are classified as advertising-supported programs. Although these applications seem to be helpful and useful, you need to think twice before you download any of them onto your computer. Of course, these apps might grant you access to more online games, but that does not come without a price, despite the fact that they are free. These programs were created as advertising tools, and they are meant to alleviate the promotion of third-party services. Did you know that you would be exposed to ads after downloading any of these game managers? If you did not, it is most likely that you were not provided with the necessary information, or you might have not paid attention to it. In any case, if you install this software, you might be putting your own virtual security on the line. If you are interested in the removal of Yayzap, you are in the right place. Continue reading, and you will learn everything about this ad-supported program. You might encounter Yayzap when playing online games on yayzap.com. This website offers a ton of different games that are placed in certain categories, such as Arcade, Strategy, or Adventure. One of the categories is called “Zap Pass,” and it supposedly holds more interesting games that you need a pass to access. In order to get the access, you are required to install the program we are discussing in this report. Alternatively, this program could be proposed to you by third-party software distributors. It is very risky to trust unfamiliar installers and distributors because there are so many malicious parties who use seemingly harmless installers for the distribution of malware. 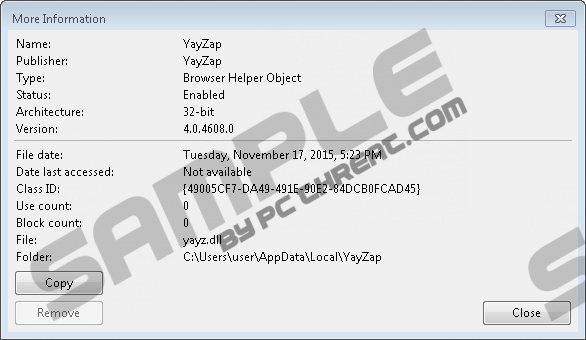 While we do not classify Yayzap as a critical threat, the software bundled with it could be very dangerous and malicious. The developer of this ad-supported program could pay some parties to promote it, but it is also possible that some parties will exploit it to lure you in. All in all, regardless of how you install this adware, trusting it is dangerous. The advertisements that Yayzap represents could come in all shapes and forms. According to the information you are provided with via the official website, this adware can display pop-up/pop-under, in-text, transitional, and banner advertisements. What kind of content could be represented via them is a mystery, but it is likely that you will be shown shopping deals, price comparisons, surveys, installers, and other kinds of content that generally calls for action. Whether you click a link, fill out a survey, or download a promoted program, the main goal for Yayzap is to push you into interacting with the content that is shown to you because this is how a profit is generated. If you do not click on the ads shown to you – which, by the way, should be represented with a brand tag – the creator of this adware will not make any money. Notably, the ads might show up before and during the games you play, which means that they might be intrusive as well. Besides displaying ads, the ad-supported program is also known for recording users’ data. Tracking cookies are employed by this app to record information, and it is most likely to be used to pick the ads you are most likely to interact with. Considering that the advertisers using Yayzap are unknown, you cannot just assume that their intentions are all good. We advise deleting Yayzap for several reasons. This program is meant to give you access to more games, but, in reality, it is just an advertising tool that brings no benefit to you. On top of that, it spies on you to assist unfamiliar advertisers who could easily present you with unreliable and misleading offers. The good news is that this advertising-supported program is very easy to delete from the operating system. You could erase the files of this adware one by one, but what we recommend is uninstalling this app, which allows you to get rid of all components simultaneously. Once you uninstall this application, you will need to restart your operating system, but it should be clean after that. Of course, that will not be the case if other threats are active. If they are, quickly install a trusted, automatic malware remover. Navigate to the left of the Taskbar and click the Start menu icon. Open the Control Panel menu and then double-click Add or Remove Programs. Find the undesirable program, select it, and click the Remove button. Launch RUN by simultaneously tapping Win+R keys on your keyboard. Enter Control Panel into the RUN dialog box and click OK.
Move to the Programs menu and click Uninstall a program. Right-click the program you want to eliminate from your PC and click Uninstall. Quick & tested solution for Yayzap removal.